G.L. 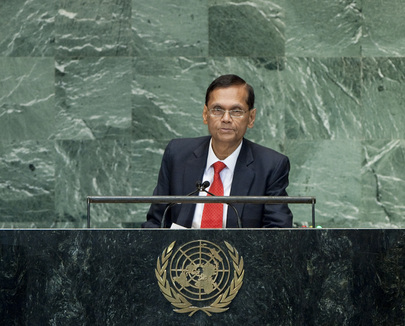 PEIRIS, Minister for External Affairs of Sri Lanka, said that over 67 years, States’ conflicting aspirations had been reconciled through the United Nations intervention. While some disputes remained unresolved, the overall results had contributed to the Organization’s longevity. The United Nations provided an “extensive” range of options for resolving disputes. Sri Lanka firmly upheld the tenets of peaceful coexistence, mutual respect for sovereignty and territorial integrity, and non-interference in internal State affairs. The trend towards selectivity and arbitrary intervention in State affairs flew in the face of the sovereign equality among States, a principle enshrined in the Charter. He went on to say that the impacts of the financial meltdown had impeded the realization of internationally agreed development goals, including the Millennium Development Goals. Any strategy to achieve recovery must not impose unjustifiable burdens on developing nations, whose voices must be heard in global discussions on such matters. There was no one-size-fits-all approach and the experiences of newly emerging economies also must be taken into account. Further, the global financial architecture must be restructured, as power had shifted from countries in the industrialized North to “power houses” in the South. Global financial institutions must reflect those “tectonic” changes, as must the United Nations. On other matters, he pressed developed nations to deliver on pledges to assist developing countries in arresting climate change, stressing the need to identify common policies for achieving social goals and protecting the environment. While the result of the Rio+20 Conference might not have satisfied the expectations of all countries, including his own, it had provided a foundation for achieving higher goals through negotiations. In that vein, he said the transition to a green economy must not create negative externalities that slowed economic growth or perpetuated inequity. Assistance under North-South development cooperation mechanisms must consider global initiatives to mitigate the adverse consequences of too rigid an application of green economic principles. Partnerships created under mutually agreed sustainable development goals did not replace North-South development cooperation. Touching on a number of Sri Lanka’s domestic successes, including a drop in absolute poverty to 7.6 per cent in 2011 from 15.2 per cent in 2005, he said the Government had worked to ensure that the fruits of economic development were equally distributed and accessible. Three years ago, the Government had ended the terrorist challenge largely through its own efforts and now was committed to redressing the grievances of all parties affected by its internal conflict. The country exemplified the challenges of emerging from the shadow of a conflict that had spanned three decades. Progress on the ground over the last three years vis-à-vis the resettlement of internally displaced persons, reintegration of ex-combatants and unprecedented focus on infrastructure had invigorated the economy of the country as a whole, and the Northern Province in particular. “No one has greater commitment to reconciliation in an all-inclusive spirit than the Government”, he stressed, noting that “unhelpful” external pressures that supported partisan interests could derail initiatives that had produced peace on the ground. Sri Lanka’s accomplishments were remarkable, considering that many developing nations continued to struggle for equitable social development. In that context, he said Sri Lanka was always ready to share its experience and was expanding its engagement in Africa, especially in the areas of trade and investment. Sri Lanka supported all multilateral efforts to enhance peace and security, and eliminate all forms of terrorism. The restoration of the rights of Palestinians was a long-standing issue that required collective attention, and Sri Lanka supported the implementation of all United Nations resolutions on Palestine that would pave the way to statehood for its people.